Ten years later, on the anniversary of Ajimu's disappearance, Medaka calls her friends to a reunion at Hakoniwa Academy. She leaves a message for Zenkichi, telling him to meet her in her office once everyone arrives.When Zenkichi comes, Medaka is sleeping on the floor, surrounded by dogs. Waking, Medaka greets Zenkichi.The dogs begin clambering over her, which Medaka finds funny. It is revealed that The End, and all the skills Medaka learned with it, have faded away. After freeing herself from the dogs, Medaka explains to Zenkichi that she has finished her "Moonsault Plan", a project to restore the moon. She explains she wants children born after the moon's destruction to see it, as well as both Ajimu and Kumagawa, so that they know she is still well. She reassures Zenkichi that both are alive, and shows him their messages from the 100 Flowers Run. Medaka explains that she has kept all the messages over the past ten years, storing them in the suggestion box. 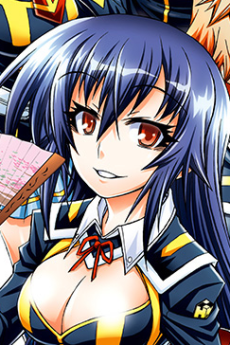 After she admits that the reconstruction of the moon will take several years, Zenkichi challenges Medaka to a duel, with the condition that she marry him if he wins. Medaka is delighted, and accepts, telling him that if she wins, he will have to marry her. Medaka charges Zenkichi, promising that she will never say goodbye to him again.